Many bacteria in foods are useful because they may contribute to the manufacture of the foods and their digestion. There are also pathogenic bacteria which cause various illnesses. 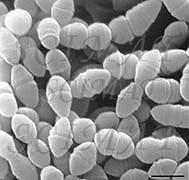 Streptococcus salivarius subsp. 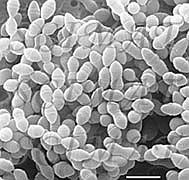 thermophilus, along with Lactobacillus delbrueckii subsp. bulgaricus is best known for its role in yogurt manufacture. Both are part of a group of lactic acid bacteria which metabolize lactose and produce lactic acid. The slow production of acid lowers pH of the milk and causes the casein micelles to coagulate and to form a gel. For comments and information on the use of the micrographs, please contact the author. Commercial interest in micrographs should be directed to photo banks such as CMSP, MS, PR, PTUSA, etc.